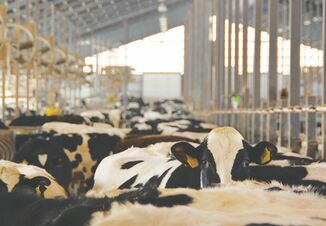 The majority of dairy operations consider raising dairy heifer replacements a major cost without receiving any return until the heifer enters the milking herd. 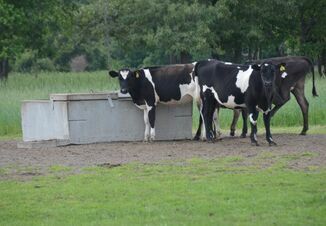 As a result, the dairy tries to minimize the cost of raising heifers by feeding hospital milk or a lower-quality milk replacer. In most cases, the least expensive calf starter is also chosen as the product to use on the farm. The cost of raising the heifer is often calculated by cost per head per day. To reduce the cost per head per day, the dairy tries to purchase the feeds previously mentioned as inexpensively as possible. Looking for the lowest price per bag or ton of milk replacer and the cost per ton of calf starter is commonly considered as the best way to reduce the cost of raising the milk-fed calf. If we look at the other livestock industries such as poultry, swine and beef cattle, they all determine their profit by the cost per pound of gain. Whatever they can do to increase the rate of gain for the least amount of cost per pound will result in more profit. Why is this approach not used when raising dairy calves? The average daily gain (ADG) is directly correlated to milk production, so it is to the advantage of the producer to maximize the ADG to receive more milk when the animal enters the milking herd. Therefore, whatever management procedures and nutrition programs that can result in a higher ADG, and also decrease the cost per pound of gain, will minimize the cost of raising dairy replacement heifers and result in a more profitable animal that enters the milking herd at a younger age. All animals have a certain level of energy and protein that is necessary for maintenance. Each time these nutrients are increased in the diet, a greater proportion of them are used for growth. This will result in a reduced cost per pound of gain. If the volume of milk fed to the calf is increased, this will result in a lower cost per pound of gain, even though the cost per day is increased. The same is true if the percent solids of the milk or milk replacer is increased. In general, anything that results in an increase in the total amount of protein and energy provided to the animal, and is also able to be used by the animal, will enhance rate of gain and reduce cost per pound. Notice in every case the cost per pound of gain decreases significantly when feeding 9 qt. per day versus 4 qt. per day, even though the total cost of the milk per day increases significantly. In the majority of examples, the same is true when increasing the percent protein and fat with only slight differences. The current price of milk and the various milk replacer formulas were all obtained on the same day to obtain an accurate cost comparison, and the cost per pound of gain was calculated through the NDS nutrition formulation program. When calculating the cost per pound of gain with calf starter, the same is true. 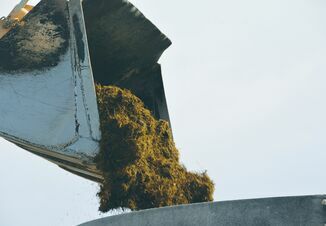 For example, when comparing the cost per pound of gain of a 25% protein calf starter (dry matter basis) to an 18% protein calf starter, the feed efficiency is significantly improved with the higher protein product, thus reducing the cost per pound of gain, even though the 25% protein product is much more expensive per ton. Calves that have a higher average daily gain will also have lower morbidity and mortality rates, will require less labor and have reduced medicine costs for disease treatments. These heifers will reach breeding height and weight goals sooner, calve at an earlier age and produce more milk than heifers, which are raised on older traditional programs, resulting in a higher profitability to the dairy. Bob Corbett consults with dairies on a variety of management areas, including mastitis, reproduction, computer analysis and nutrition.